Thanks - It is less expensive than the stuff I was looking at. I have emailed them for a sample. I was thinking about adding this type material to the headliner and actually spraying on the floor if you have ever worked with the spray I would be interested in that as well. Taking them apart is like Christmas,,,you dont know what you are going to find. The bad part is,,, it seems to always hurt the wallet! That is a understatement. It looked fairly solid but until you start ripping it up you don't really see that hidden damage. The bigger problem is when to stop. It is just one more part - One more detail - one more dollar. I was looking at the hinges and it make sense just to rebuild them with new pins but that is another dollar spent. I could leave it but the lines will be off if I need to replace them in the future. So where do you stop. A 2x4 to the head will help !! Haven't worked with the spray, just the 3M Spray Trim glue part # 08074 and the insulation. The material is great cause you can use regular scissors to cut it. Also I am not joking the stuff is crazy lightweight. Probably two of their rolls you could do your whole inside of the car, and even double layer it at that. Not a lot to report today. It is suppose to rain most of the day so I started early so I could get the car over to the guy who is going to soda blast. The mirror finally came off with a renewed effort first thing this morning. Removed the right fender , deck lid , glass , rear bumper and yes that damm mirror. The blast will be a couple of days so I won't have any pictures until it gets back. 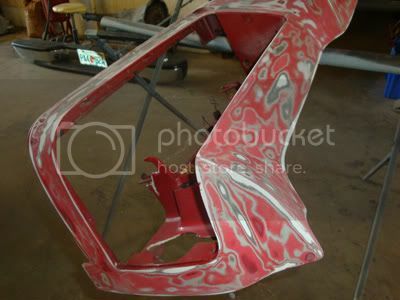 I sent the hood , deck lid and fenders with the car. I left the doors on for now as I am thinking about how I can manufacture some pins for the hinges , find new hindges or find someone who can make new hindges. I have a few days so I will work on the bumpers and front clip. Hands are now torn up , back is sore but still having fun!!! I left the doors on for now as I am thinking about how I can manufacture some pins for the hinges , find new hindges or find someone who can make new hindges. I can't think who it might be right off, but you can get them rebuilt or rebuild them yourself, someone help me remember who you can get the parts from. Hey, enjoyed talking with you. Keep us updated as to it's progress! I got new door pins for my Runner right from carquest, nice and cheap. The way i like it. Back at it. 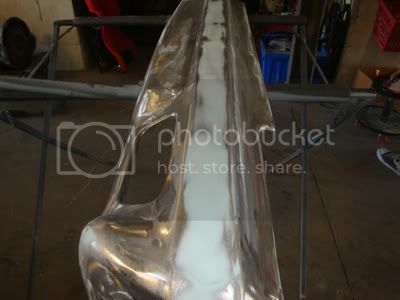 The car is on its way back from getting blasted so I will hit it tonight with some primer. I have been working on the bumpers and front clip in my down time. As you can see - the front clip as some work to do for the headlight cover to work again. 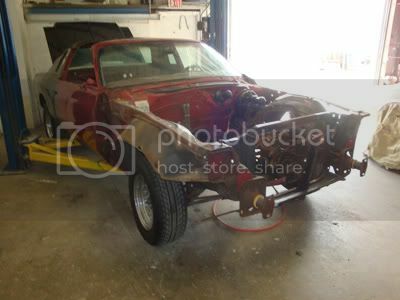 I plan on filling in with some fiberglass and drilling a new hole. Should be an easy fix. Looking forward to getting the car back but also afraid of what else will need to be done now that I can actually see the car. Are you still going to paint your bumpers? Sort of - I am thinking black chrome. Isn't that an "oxymoron"? Kinda like "super Chevy"?